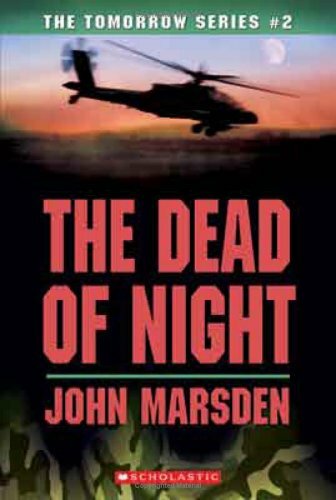 My teaser this week comes from John Marsden’s The Dead of Night, book #2 in the Tomorrow series. In order not to spoil book #1 for those of you who haven’t read it, I will only quote a brief excerpt from School Library Journal just so you can get a feel of what the series is about. A few months have passed since Ellie and six of her friends returned from a camping trip deep in the Australian outback to find their country invaded by an unidentified, non-English-speaking nation. My teaser (which is the opening paragraph of the book and does not spoil book #1 either, for those of you who haven’t read it). Damn this writing. I’d rather sleep. God how I’d love to sleep. It’s been a long time since I had a peaceful night’s sleep. Not since I went to Hell. Since I went to that complicated place called Hell. Honestly, before you go any further, I would suggest not even reading this review. Instead, you should just go out and get a copy of this book and start reading NOW. It’s not the best literature around, by any means, but I promise you’ll be entertained. 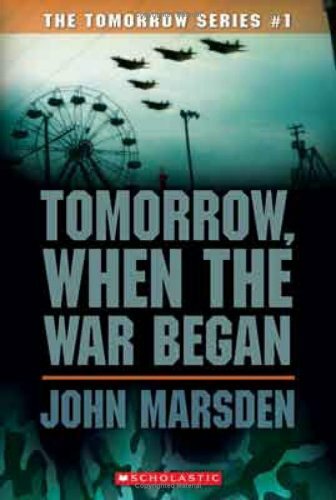 Tomorrow, When the War Began is the story of some Aussie teenagers who decide to go camping in the Outback over school break. They are gone for a week and the grouping is sort of odd. Ellie and her friend invite five other teens that are somewhat of a mish mash. They all get along—for the most part—and have a fun little getaway. But then they go home. And they discover a lot has changed since the left a week before! The seven pull up in Ellie’s driveway to discover four of her dogs dead. They are all chained up as usual, but for whatever reason, Ellie’s home has been deserted, to the point where the dogs died from neglect and starvation. Ellie immediately realizes something has gone terribly wrong. She and her friends rush off to investigate each of their own homes only to discover the same conditions—no humans and dead or dying animals. The teens eventually realize that their families and friends are all being held hostage in the city. Guards patrol the streets and try to capture, wound or kill anyone that has escaped imprisonment. The friends retreat back to the woods but are torn between saving themselves or attempting to help those they love that have been imprisoned. One interesting factor of the book is the idea that life goes on despite major upheavals such as the one Ellie and her friends have experienced. They are all deeply worried and fearful of the new circumstances of their country, and yet they still are subject to basic human emotions. Love is still blossoming despite the ordeal they are all dealing with. Ellie, for one, is caught in a love triangle, and although she becomes a fugitive dealing with a sudden war on her country, she is still affected by love, lust and romantic tendencies. If you are a fan of YA dystopian fiction, you will love this novel. It kept me completely engaged—I read it in the span of a day and although it has been a week since I finished it, the excitement I felt while reading it has yet to wear off. I can’t wait to read the rest of the series. I read The Hunger Games during Dewey’s 24 hour read-a-thon. And I loved it. But really–what could I possibly say about ti that hasn’t been said already? First off, if you haven’t read The Hunger Games by now, you’ve at least heard of it, which leads me to believe that those of you who haven’t read it are actually pretty stubborn. I was in the same boat. I saw this book everwhere but kept telling myself that it wasn’t my schtick. And then I got tired of being the odd man out. So I bought it (along with Catching Fire) then waited anxiously for the read-athon because I wanted to save it and by then I had convinced myself I would absolutely love it. And right I was! Katniss Everdeen is a sixteen year old who lives in a world where the government subjects the population to a horrible tradition known as the Hunger Games. Children from the age of eleven up until eighteen are chosen at random to compete in the games–two from each district. Katniss belongs to the twelfth, and last district. Hers is a district that has only ever won the games twice in over decades and decades, so the district is filled with hopelessness and shame. Although they are supposed to act celebratory during the tribute ceremony, where the tributes (ie the two competitors from disrict 12) are chosen, the mood is sullen and Katniss, along with her peers, all fear that they will be chosen. However, it is not Katniss but her younger sister Primrose who is chosen at random as a tribute, and suddenyl Katniss is forced to make a terrible decision. She knows Primrose will die if she goes in. But Katniss is equally convinced that she herself has no chance of winning the games. Even so, she cannot fathom allowing her sister to compete, so she boldly offers herself up instead. Katniss then begins the journey to the secret location of the Hunger Games, along with Peeta, the male tribute from District 12, where they first train and then begin the wretched game. And thus begins the book . . . I read that Collins got her inspiration from flipping back and forth on the TV between a reality TV show and war coverage. Eventually, she said, it”began to blur in this very unsettling way”. I found her remark to be very interesting. It’s true that many times dystopic literature can be a heightened portrayal of current social situations. And I think a lot of that can be seen in The Hunger Games. For one, social standing still plays a large role. The poorer you are, the more likely you are to be entered for the games because you receive charity if you are willing to enter more than once–something Katniss has been forced to do. The scare tactics used by the government in the book are also based on reality, although magnified to an extreme in this instance. The Games are a way to force the people to see that they have no choice but to obey their government. And obey they do–some districts even going so far as to believe that entering the Games is an honor. These districts train their youth almost from birth so that they may be able to succeed if they are lucky enough to be given the chance at becoming a tribute. The second book in this trilogy, Catching Fire, came out about two months ago. I have it waiting in my TBR pile–hopefully I’ll be able to get to it soon. There is also a third book, completing the trilogy, which is supposed to be released sometime next year. From what I understand, Ms Collins is still writing it. I can assure you though, I will be pre-ordering a copy as soon as I am able! Collins is also adapting The Hunger Games for film, so that should be interesting. I am not a movie person, in general, but I will make it a priority to see The Hunger Games on film once it comes out! The Hunger Games counts toward the YA Dystopian Reading Challenge going on right now over at Bart’s Bookshelf! Here are some reviews–once again, there are too many to list all of them. However, if you have reviewed this book and would like me to post a link, just leave the link in the comments section of this post. Unless you’ve been living under a rock recently, you’ve likely seen this book on some other blogs. It’s been doing the rounds a lot recently and I kept seeing it and thinking nah, not my thing. But eventually, after seeing (almost) everyone raving about it, I figured I needed to pick it up at once. The Knife of Never Letting Go is the story of a boy named Todd Hewitt. In a month’s time, he will be thirteen and thus considered a man in his village of Prentisstown. Prenstisstown is inhabited by men only, all the women having died years ago. Something else odd about Prentisstown? The thoughts of every man are transparent. 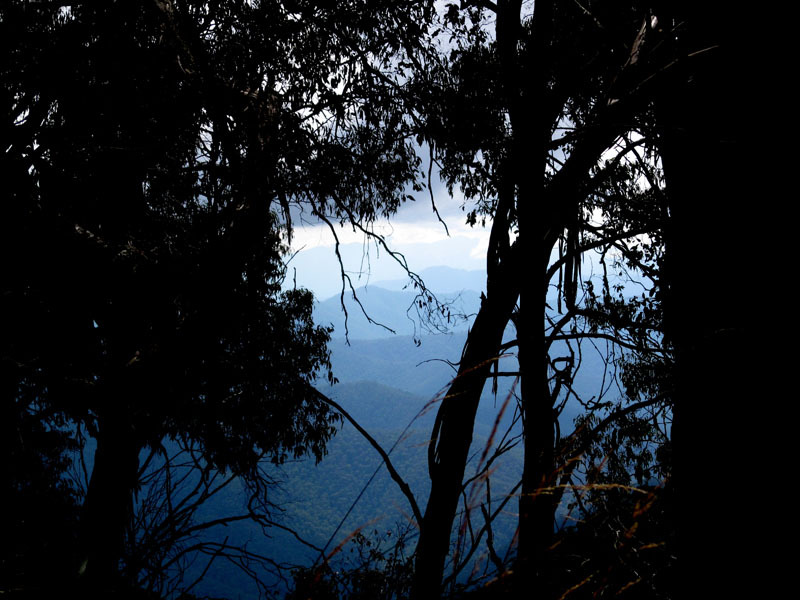 Their thoughts are spoken aloud in what is referred to as Noise. Now obviously, this is cause for concern, mainly for two reasons, the first reason being how would you like for everyone to know your thoughts? I shudder at the possibility! The men have sort of discovered a way to conceal the thoughts that they want hidden by kind of tucking them away and putting more innocuous thoughts at the forefront, but still–it’s a bummer. Plus, think of how loud it would be. You’d never have any respite! I know by reading some reviews that even some readers had a problem with the concept of the Noise and being distracted by it. Imagine living with it! The book opens with Todd being forced to flee Prentisstown with a girl he’s met named Viola, obviously not an inhabitant of the town as she is a girl. Other than that, I won’t say much more, for obvious reasons. Rest assured, however, that you’re in for an action packed adventure with this one. This would be a book to choose for the facst moving plot as opposed to literary quality. In fact, the plot moves so quickly that that was another complaint I read in reviews regarding this book. That didn’t bother me in the slightest. With a book like this, I want my attention to be captured every second of the way and it was. The Knife of Never Letting Go is the first book of Ness’s Chaos Walking series. (Is it supposed to be a trilogy? I’m not sure.) Anyway, the second book, The Ask and the Answer, is already out. Now, I’ll let you in on a little secret. I rarely ever am so bowled over by the first book in a series that I have to immediately read the following book(s). Even if it was a book I liked, I’m likely to take a break of at least a few weeks before continuing with a series. I just prefer to wait awhile and with some books I never even continue on in the series, even if I enjoyed the first book. But with The Knife of Never Letting Go, I got to the end and then cursed myself for not having the second book waiting. I need to know what happens and I need to know NOW. So what did I do? Within five minutes of finishing the book, I reserved the second book from my library. Likely it will arrive in time for the read-a-thon, so it could definitely be a contender. Which reminds me, for those of you who think you’ll be reading this book, it is a great choice for the read-a-thon. So there you have it–another rave review for The Knife of Never Letting Go. It was a fun, fast paced read and if you’re looking for an action packed book that will captivate you, this one is a great choice. It also counts towards the YA Dystopian Reading Challenge over at Bart’s Bookshelf. There are even more reviews out there but I think it would take me a day or two to list them all! Well, I did it. I signed myself up for another challenge. I can’t help myself though. This one looks like so much fun. It is being hosted by Darren from Bart’s Book Shelf. Darren has also posted a pretty big list of books for inspiration. I’m really enjoying The Knife of Never Letting Go, so there’s a good chance I’ll decide to read the second in that series, The Ask and the Answer. I’ve also seen a lot of Meg Rosoff around so I’d love to read some of her books. The Maze Runner looks good too. And I read Uglies last year, so I may continue on with the other books in that series. Are you joining this challenge? If so, what are you reading?